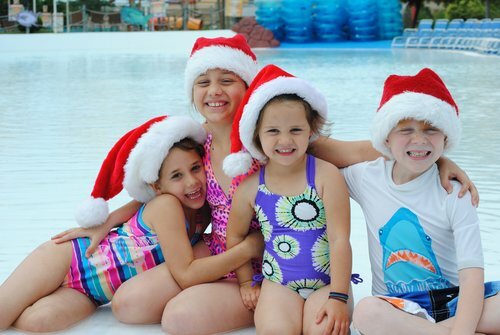 Christmas in July at Hawaiian Falls! Christmas is coming early this year at Hawaiian Falls! On July 21st Hawaiian Falls is partnering with WFAA Santa’s Helpers to collect toys for children in need throughout Texas. Guests who bring a new, unwrapped toy to any Hawaiian Falls location will get admission for just $8.88! This over $20 of savings from the Big Kahuna ticket! Have a fun day with your family and donate fun to a child in need. WFAA Santa’s Helpers has been conducting toy drives for almost fifty years. During this time WFAA has donated thousands of toys to children throughout Texas. Celebrating Christmas in July means more time to collect toys for the kids! Come enjoy a fun day with the family at Hawaiian Falls and help bring the joy of Christmas to the summer. Christmas isn’t the only time for giving! Spread joy throughout the year by donating toys to this great cause. If you’re visiting the Garland location, join us for a free meet-n-greet with Santa and his princess friends! Come check out Santa in his summer gear and bring some Christmas cheer. We are also hosting an exclusive party that gives you a break from the sun, a front spot in line to meet the characters and a luncheon with Santa, the Ice Princess and the Snow Queen! This is the perfect time for photo ops and quality time with the characters. All of this, plus admission, is included in the low price of $18.88 when you bring a new, unwrapped toy and just $10 for season passholders. All Hawaiian Falls locations are participating in the Christmas in July toy drive, so bring the family for a day of fun in the sun, all for a good cause. To learn more about Christmas in July, Hawaiian Falls or to buy your tickets please visit https://hfalls.com/christmas-in-july.